Executives from a pair of Canadian oilsands companies extolled the virtues of a carbon tax on one of the largest stages for the global energy sector. 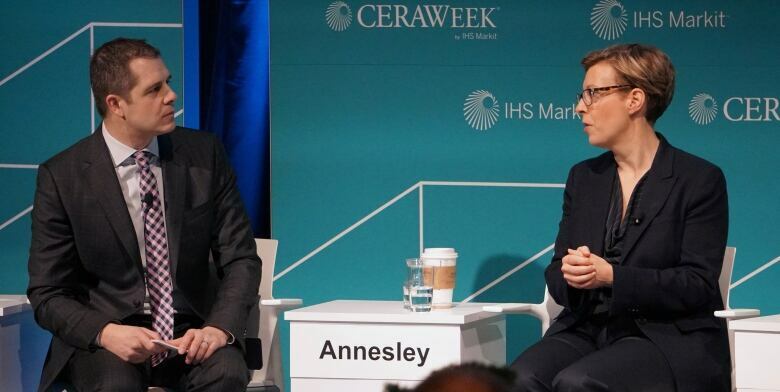 Climate change is one of the dominant topics of this year’s CERAWeek, a conference in Houston sometimes dubbed the Super Bowl of the world’s energy sector. This year’s conference has gathered together 4,000 delegates from 70 countries, including politicians, investors and oilpatch executives. The governments of Alberta and Canada are close to getting it right on tackling carbon emissions, said Janet Annesley, a senior vice-president with Husky Energy, during one of Tuesday’s panel discussions. She began by pointing to the decision to accelerate the phaseout of coal-powered plants, which will reduce emissions for the country and for companies like Husky, which buys electricity off Alberta’s power grid. “We can see some lower carbon inputs to our business,” said Annesley, who previously worked for Shell, the Canadian Association of Petroleum Producers and in the office of former federal natural resources minister Jim Carr. Annesley also praised the policies to tackle methane emissions, before applauding the carbon tax. “Not only do we have the carbon tax that applies to large emitters like Husky in the oilsands, but frankly, the flip side is that the government is using some of those revenues to help industry reinvest in technology. The combination of both of those policies is particularly powerful,” she told the panel’s audience. Specifically, the industry is using funds from the carbon tax to help research new technologies, such as methods to capture and sequester carbon. The policy is not perfect, she said, pointing to the cost and controversy of the carbon tax, in addition to the need to monitor its impact on the Canadian oil industry’s overall competitiveness. And carbon tax policy in both Alberta and Canada could change this year, with both provincial and federal elections taking place in 2019. Some parties want to scrap the carbon tax, while others want to keep the status quo. But Annesley says progress is being made. “We’re in a very good place today — a better place than we were four years ago,” she said. In an interview on Tuesday, Little said while Suncor still supports the carbon policy in Alberta, he believes it could be improved. There are too many exemptions, he suggested, so not everyone has to pay the tax. In addition, he said the province should lower taxes elsewhere so that the carbon tax is revenue-neutral instead of an extra burden. The debate in the oilpatch about the carbon tax is in large part due to the fact the industry is suffering from low commodity prices and the need for more pipelines is not being addressed, Little said. Investment has also plummeted since the 2014 price crash. Large oil companies in Canada attract international investors and that’s why they are more likely to favour a carbon tax compared to small- and mid-sized companies. Steve Reynish, also with Suncor, said it’s important to have stability with carbon policies, instead of changing every election cycle. There’s already a vast discrepancy of carbon policies across jurisdictions, he said. “We need a steady hand; we can’t keep changing these policies on a regular basis,” he said while on stage. Before Alberta Premier Rachel Notley introduced the province’s carbon tax, Alberta charged large industrial polluters $15 a tonne for emissions over a set amount, through a plan known as the Specified Gas Emitters Regulation (SGER). Adopted in 2007, SGER made the province the first North American jurisdiction to set a price on carbon, however, the policy would later be roundly criticized for being too lax to make a meaningful dent in overall emissions. As carbon policies evolve, some would like governments to take into account emissions around the world. For instance, if natural gas from Canada is used to displace coal in power plants in Asia, then Canada should receive some credit for the reduction of global emissions. The need for the energy sector to address climate change has been a recurring discussion at the conference, brought up by the International Energy Agency, industry CEOs and politicians. It was even a topic for OPEC’s secretary general during his time on stage.